Raise your glass for The Nightingale! Templates on Avery.com will help you create your own labels with book quotes, scenery, characters or download your own images. Let your book pick inspire you! Beautiful table setting with spring flowers and a quote from The Nightingale. Book review of 'News of the World' on Book Club Blogger! What you will need: Laser Vellum Inkjet Paper, 8.5"x11"
​Uncover the items, set your timer for a minute or so and let everyone try and memorize as many objects in detail as they can before you cover it back up. Give three minutes or less for everyone to jot down as many detailed items as possible. Whoever has the most guesses of items wins! Don't forget a prize or two for first place and runner up. Scrapbook paper for the bookmark is unique to the character and charms are for the ribbon or string. 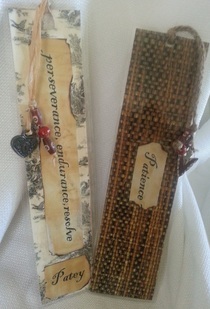 The charms (connected with the character) give the bookmark an extra special touch! This will work for any novel you've read in book club. How to play: Find words that have meaning to the story (make sure you choose easy to hard words) type up and print out. Pass out one word scramble sheet to each book friend. Set the timer for 3 minutes or less and see who can unscramble the most words. *Don't forget to give a prize to the one who unscrambles the most!